Don't drag this out. Stay on top of it and get it done!!! Shocking or Super-Chlorinating pool water!!! Shocking or super-chlorination is the application of quick dissolving chlorine, with the intention of rapid increasing the pool's chlorine level. The reasons for shocking are due to the presence of rampant algae growth, cloudy pool water, underwater slimes and high levels of combined chlorine. Chlorine is the most popular pool water sanitizer. Sanitizing is a must, for proper pool water management This is done with a variety of products such as, liquid chlorine, dichlor, calcium hypochlorite, lithium hypochlorite, hydrogen peroxide or non-chlorine shock. Pools equipped with a salt chlorine generator, in most cases, can simply dial up the chlorine output to shock mode. Salt Chlorine generators are a better way to utilize chlorine, producing more controllable results. They eliminate the need to handle, measure or store chlorine products, while reducing buildup problems. A PockeTester Kit is a convenient way to monitor the salt level, as well the overall water chemistry. 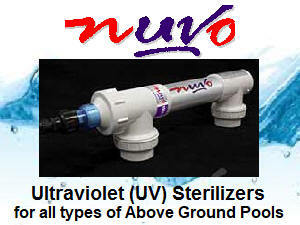 An Ultraviolet Pool Sterilizer can help control the growth of microorganisms, reducing the need to shock as often. UV kills virtually everything passing through the cell, but does not replace chlorine or other persistent sanitizers. Adding a Solar-Powered Pool Mineralizer introduces copper and zinc ions, that provide algae control and additional backup sanitizing. This reduces the amount of chlorine required, to maintain an optimum level. A Solar UV Sanitizer creates "free radicals" which help destroy algae and other microbes and provides some sanitizing backup. It doesn't replace chlorine, but will provide better results and reduce chlorine usage. Water testing determine the extent of the need to shock or superchlorinate pool water. A ColorQ, All-Digital Water Tester can perform all of the common pool water tests, while eliminating the color-matching and guesswork. There is a model, for every pool testing need. The Circulator is a replacement return jet fitting, that creates a spiraling return flow, which aids in dispersing the shock treatment, to all areas of the pool. The WaterLink SpinTouch Labs are the ultimate, doing up to 10 different water test factors, in just 1 minute. Voted product of the year, by the industry trade association. How to properly shock treat a swimming pool? Shocking or super-chlorinating a swimming pool refers to the application of large quantities of chlorine, non-chlorine shock or hydrogen peroxide. If a salt chlorine generator is being used, most models have a boost mode, which raises the chlorine output, to perform a shock treatment. Typically 5-10 times the normal dose is used, based upon actual conditions and needs. The purpose of this large dose is to break down the combined chlorine, organic waste, algae and contamination and re-establish a positive level of Free Chlorine. Shocking must be repeated, until such time as a stable Free Chlorine reading can be achieved, for at least a few hours. Make sure that a Free Chlorine capable test kit is being used, in order to know when breakpoint chlorination has been achieved. Dragging out this process will only serve to increase the amounts of chemicals required. Products such as liquid chlorine, sodium dichlor, lithium and calcium hypochlorite and non-chlorine shock are used for this purpose. None of these products can be used in a biguanide-maintained pool. Only concentrated hydrogen peroxide can be used to shock biguanide pools. A pool should be shock treated at the first signs of algae, after heavy rainfall, after periods of heavy bather usage and at the onset of a loss of water clarity or quality. Another common practice is to shock treat the pool every Sunday evening. Typically, this is after a period of high bather demand and will help to re-establish the sanitizer level. A periodic shock treatment helps to prevent the development of sanitizer-resistant microorganisms. If problems arise, refer to the Pool Problems Page, as a source of problem-solving information, broken down into various categories. Scroll down the page and click on the linked keywords, catch phrases or images, in the archived answers below, to access additional information, on that topic or product. Do you know what's in your water? If you're having problems, with algae, sanitation or water clarity, testing allows you to better understand the chemistry and determine the cause of the problem. Once understood, you can select the best treatment option. Understanding the nature of the problem, should be step one. For information about our full selection of testing options, visit our Test Equipment Store. ► Which Shock Treatment To Use? I see many different types of shock available, is there a best choice? The purpose of using a shock treatment, is to quickly boost the free chlorine level, usually because of algae problems or high combined chlorine readings. Trichlor granular should not be used, other than to treat a specific small area in a gunite pool. Liquid chlorine or lithium hypochlorite are the most universal, as neither contributes any unwanted byproducts. The liquid product, which is cost effective is bulky. Lithium hypochlorite is a convenient, quick-dissolving granular product, but will cost more to use. Both, liquid chlorine and lithium hypochlorite will tend to raise the pH. Sodium dichlor is very convenient and has minimal effects on the pH. However, it contributes cyanuric acid to the water, with each addition. It should not be used, as a shock treatment, if trichlor is being used as a sanitizer or if the cyanuric acid level is 100 PPM or higher. Calcium hypochlorite is cost effective, but will increase the calcium hardness of the pool water, with each application. It would not be a good choice, if the pool water hardness is 250 PPM or higher. Potassium monopersulfate or non-chlorine shock does not add unwanted byproducts, but is the least cost effective. However, when used in conjunction with other chlorine shock products, it seems to produce better reductions in the combined chlorine level. As you can see there is no one best product, for all pools. Your pool's water chemistry and how the pool is sanitized, will play a role in deciding which product is best and/or most cost effective. Use the label recommendation, as a dosage guide. Your pool could use more, as it will depend on the condition of your particular pool. Wait a few hours and retest. Keep adding until, you get a free chlorine level that lasts through the night. If the pool is equipped with a salt chlorine generator and the chlorine level needs to be raised, the same guidelines apply. I hope that I have provided the solution. ► Needing A Bit More? Our pool has an automatic chlorinator and it doesn't always seem to provide enough chlorine. I have opened the settings all the way. A few times the water started to cloud. Any advice will be helpful. Try and keep the chlorinator filled with the tablets. Don't wait for them to dissolve half way or more. The more chlorine in the chlorinator, the more that will dissolve. Try shocking the swimming pool every Sunday evening. The weekend is usually the most active period and the shock treatment will help re-establish the Free Chlorine level. That way the chlorinator does not have to play catch up. Adding a Salt Chlorine Generator will replace your existing chlorinator, with something much better. A good unit should provide most of the oxidation, that your pool requires, and enable the chlorine to act as a sanitizer. It allows you to shock the pool, by simply raising the setting to boost mode. You'll get better and more consistent water quality and avoid the buildup problems due elevated levels of cyanuric acid. These suggestions should help. Just make sure that you test for Free Chlorine regularly and often. Enjoy the summer. ► How Long To Wait? I have seen and heard a lot of different times on how long to wait after shocking a pool before swimming. Specifically with non-chlorine shock I've heard from 15-min.to 1-hr. If you would tell me what you've been advised about this. If my pools free chlorine is 0.5ppm lower than the total chlorine, then I add a 1/2 pound of chlorine shock to the 20,000 gallon pool to equalize them. This is my usual protocol. This usually raises the total chlorine about 1 ppm and the free chlorine about 1.5 ppm (which gets them back to the "balanced" state, which is normally both at 2 ppm), even though the chlorine is still really low should I stay out of the pool for long period or just what would you say to be safe. I have heard anywhere from 3-12 hours after adding chlorine shock. The chlorine shock is always added into the skimmer when needed and the non-chlorine shock is evenly dispersed into pool by hand (2 lbs. weekly regardless). In case I have confused you the question would be how long to wait before swimming after using both of the different shocks (they wouldn't necessarily be done at same time either). I just wanted to tell you where I kept the chlorine level and dosages to give you a better idea. What you are doing is merely bumping up the level - going from the low side to mid range. All you need do is wait until the chemical has dissolved and dispersed. 15 minutes should be OK. On the other hand, when shocking eliminate an algae problem, you might have to wait until the chlorine level has dropped into a more comfortable range. You never want to jump into a cloud of chemicals that have not dispersed. A product like The Pool Circulator helps boost circulation by as much as 1500% and assures the quick dispersion of the chemicals. It also helps eliminate the dead spots that lead to algae growth. I hope this information is helpful. I have a 10,000 gallon Marcite pool, everything was fine and clear. pH = 7.4, Alk = 100. Chlorine = 3.0, Free Chlorine = 0.5, Hardness = 250, Stab = 45. I noticed the free chlorine was low and I shocked the pool 4 days ago, tying to burn out everything, and it did not bring it up from 0.5. So I gave it a double shock last night and now the pool is very cloudy white, and the free chlorine is 2.0. I added 2 oz. of an algaecide product, 24 hours after I shocked it 4 days earlier before the double dose of shock. Could the clarifier or algaecide have reacted with the extra dose of shock? If so, what should I do? I am keeping the pump going and I washed it out 2 times already since last night. Should I just wait it out, or should I add a Clarifier to it to help? Will it just make it worse? The reason that the Free Chlorine level failed to rise was probably due to the presence of a film of algae or bacteria on the underwater surfaces. It also explains the unacceptably high difference between the Free and Total Chlorine readings. A maximum of 1 PPM is preferred. The water may have looked clear, but there was a biofilm on the underwater surfaces. That being the case, it is necessary to keep adding shock treatment, until the difference narrows or the water clears up. The cloudy water is the result of the dead algae and debris, as opposed to poor water chemistry. Adding a clarifier will help deal with the fine particles of dead algae and debris. The water should clear up once the chlorine has destroyed all of the biofilm and a suitable Free Chlorine level is being maintained. From that point on, maintenance should be easier. For free chlorine testing, I suggest using one of the ColorQ all-digital, electronic water analyzers, as they provide the right kind of information, without color-matching or doubt. To help assure proper overall pool water chemistry, go to a pool store that has a very capable, professional lab such as a WaterLink SpinTouch Lab, rather than a less accurate test kit or strip reader. I hope this helps to clear thing up. Every time I add pool shock to my pool it turns my crystal clear water a milky color and it stays milky for 4 or 5 days. The pH and Chlorine levels are good and the filter (cartridge) is clean. My pool is in ground and approx. 13000 gallons. The pool store is no help and just wants to sell me clarifier. Any ideas in what I should be doing? Thank You Very Much. Most likely the pool shock is calcium hypochlorite. and the directions call for you to broadcast it into the pool. This raises the pH and TA Because the product contains calcium, the hardness levels rises each tome the product is added to the water. This may not present a problem, if the water is soft - low hardness. However, if your calcium hardness is above 200 PPM, it could be a problem and result in exactly the problems that you are experiencing. If this is the case, stop the use of calcium hypochlorite for shocking or daily sanitizing. For shock treatment, use liquid chlorine, lithium hypochlorite, non-chlorine or dichlor, if the stabilizer level is not too high. Adding a calcium sequestering product is a good idea, if you calcium hardness level is above 200 PPM. Want a way to virtually eliminate the need to shock a pool and eliminate the daily chlorine additions? Look into a salt chlorinator. I hope that I have been helpful. Enjoy the season. Hello, here are my current readings: Hardness: 500, Free Chlorine 10, Total Chlorine 10, pH 7.2, Alkalinity 80 and CYA 30. The problem is that after I shocked my pool on Sunday night the Chlorine residual has not come down to below 10 yet. My pool is 16x32 with a shallow end of 3' and a deep end of 7.5' and the deep end is cove shaped which means the walls are sloped. According to my reading the calculation is: length x width x av. depth x 7.5 x 0.85 (for sloped walls). So I calculated 17,136 gallons. I am the new owner of the house with the pool and this is only the second week the pool has been open. When I shocked (superchlorinated) my pool on Sunday night I thought I had a 20,000 gallon pool because that is what the previous owner told me. However, as the measurements show above, the pool is closer to a 15,000 gallon pool. The instructions on my chlorine bucket say to use 5oz per 5,000 gallons so I added 20 oz. of chlorine granules into the skimmer. I also left the 2-3" chlorine tablets in the skimmer that are normally there. It is important to note that I have one of those blower driven pool domes over the pool so the water never gets hit by direct sunlight. However, I would expect that by Wednesday morning the chlorine level should have come down by now. Even if I accidentally miscounted and put in one extra scoop to make it 25oz, should the chlorine levels still be that high? Should I look into adding a chemical that will lower the chlorine level for me or should I just wait it out? Thanks for your help. You neglected to tell me the type of granular chlorine, so I'll assume that it has about 60% available chlorine. Based on the amount that you added, a reading of 10 PPM is not unexpected. The problem isn't that you added an extra 5 ounces. The problem is that you didn't even need 20 ounces. The 5 ounce/5,000 gallons dose is more than a normal maintenance dose. In your case, the pool did not require a major shock treatment. The fact that the Free Chlorine and Total Chlorine readings are the same seems to bear this out. The amount that you added was more appropriate for a pool with visible algae. By the time, you get this email, I suspect that the level will have dropped. There is a chemical that can be used to quickly lower chlorine levels. It is usually called Chlorine Neutralizer and many pool dealers carry the product. Here's something to remember. You can always add more - you can't take out. The shock dosages on the chlorine packaging are guides: some pools will require more or less based upon the actual conditions of the pool water. I hope that I have been helpful Enjoy the pool. Thanks for the info. A number of places have been saying I should shock the pool once a week. It would appear though that I should really only shock the pool when the combined chlorine gets above zero (to a measurable amount) or when there is an algae or other issue. Does that seem right to you? Thanks for the quick reply by the way. It is uncommon to have the total and Free chlorine readings the same. That implies zero combined chlorine and that is not the real world. You should shock if the combined chlorine is above 1 -2 PPM, at first signs of algae or loss of water quality or anytime the Free Chlorine level bottoms out. The absence of Free Chlorine can be the result of heavy bather usage, heavy rainfall or insufficient chlorine being added. The practice of shocking a swimming pool once a week, does have a purpose: it helps to prevent the growth of resistant microorganisms. Enjoy the season. How to reduce the need to shock treat a pool. Use a salt Chlorine Generator for better control and fewer byproducts. Adding an Ultraviolet Sterilizer kill microorganisms, allowing chlorine or bromine to work better. Better chemistry promotes sanitizer effectiveness and produces better results. Dual-Ion Purifier, uses copper and zinc ions. For all types of pools. Kills virtually everything, passing through, even sanitizer-resistant microorganisms The Pool Circulator eliminates dead zones and improves sanitizer effectiveness. ColorQ All-Digital Testers are easy to use, to help optimize water conditions. ► What is Non-Chlorine Shock? What is potassium peroxymonosulfate (32.18%)? Is it effective when used alone? Are there possible dangers when it is used in conjunction with any of the common pool chemicals? This is the chemical that is typically marketed as non-chlorine shock. Like chlorine and bromine , it is an oxidizing agent that will destroy organic contamination and decompose dead algae and debris. However, it is not considered a sanitizer and must be used with an approved sanitizer: all except biguanide. If you add it alone, it will destroy contamination that might, otherwise have consumed some of the chlorine and/or shock. It will act as a shock treatment. If it is in excess, it will convert into chlorine, by reacting with any salt that might be present. In a chlorine based pool, it will do exactly the same thing, However, it may show up on the readings as a reduction in the combined chlorine and an increase in the free chlorine. It will destroy odorous chlorines, by converting them into free chlorine. In a bromine pool, it will work exactly the same as with chlorine, except that it will convert the bromides (present in the water) into bromine, if added in excess. The advantages are that is very quick dissolving, gives the chlorine or bromine level a boost, allows an automatic feeder a better opportunity to keep pace with the bather demand and contains no unwanted byproducts such as calcium or cyanuric acid. Its cost is probably higher and there is the only serious disadvantage. However, in most pools it will have positive advantages. Never mix with any chemicals in the dry state. Always add to the add. The material is safe to use, as directed, in all types of pools and with all sanitizers. It cannot be used in biguanide pools as it will destroy the biguanide polymer. This is actually a preferred method of switching from biguanide to chlorine or bromine. I hope that this information proves helpful. ► Too Much Stabilizer And Confused? Hi Alan, I have a question about shock. I am using a feeder with 3" chlorinating tabs. Last year my pool was way high in stabilizer and I could not get it lowered. Everyone tells me different types of shock and I get confused. Can you just tell me the name of a shock I can go buy and I don't have to worry about trying to figure out what is in each type. Thanks. A simple answer might not be best to solve your problem. You need to read the labels! Being that you are using trichlor tablets, do no t use any shock product that contains sodium dichlor, as it will only speed up the increase in the stabilizer level. You should use liquid chlorine, lithium hypochlorite or non-chlorine shock. If your calcium hardness level is under 250 PPM, you could use calcium hypochlorite, as well. Just monitor the calcium hardness level once a year and discontinue, if the hardness rises above 300 PPM. The only way to lower the stabilizer level is to replace water. High levels can tend to make chlorine less effective. Adding a Salt Chlorine Generator will replace your existing chlorinator, with something much better. A good unit should provide most of the oxidation, that your pool requires, enabling chlorine to act as a sanitizer. It allows you to shock the pool, by simply raising the setting to boost mode. You'll get better and more consistent water quality and avoid the buildup problems due elevated levels of cyanuric acid, caused by prolonged use of trichlor tablets. I hope that this information will enable you to make a better choice. ► Lithium Or Calcium Hypochlorite? Alan, I am preparing to open a vinyl liner in ground pool installed last fall. The pool has an in-line chlorinator and we use stabilized sticks. What is the difference between Lithium Shock and Calcium Hypochlorite Shock? Would you recommend one over the other? We don't know which one to use? We live in Chicago and want to protect our pool investment. Thanks. PS Your website is great, but I couldn't find the answer to my question. Did I miss it? You got me! Well sort of! There are references to the 2 products throughout various pages, but not all wrapped up, nice and neat, in a question like yours. Lithium shock has 35% available chlorine, is completely soluble, dissolves quickly, contributes no problematic byproducts and will raise the pH. Calcium hypochlorite has 65-70% available chlorine, is not completely soluble, dissolves slowly, contributes calcium hardness to the water and will raise the pH. If you have calcium hardness readings above 200 PPM, the answer is simple - use lithium, liquid chlorine or non-chlorine shock. If your calcium hardness is under 200 PPM, the choice is yours. However, from the perspective of the vinyl liner, calcium hypochlorite is not best choice, especially, if it is added by broadcasting across the surface. The important thing to remember is to use a quick dissolving shock and avoid allowing chlorine products to remain in contact with the liner. While you might to able to use a dichlor product, I would not recommend it in your situation. You are already using a stabilized chlorine and the use of dichlor will only accelerate the rise in the cyanuric acid level, forcing a partial water replacement. I hope that the question has been answered. I'll post it. ► Lithium Or Monopersulfate Shock? I have used lithium hypochlorite for years successfully. I just read about potassium monopersulfate. Is this something new and is it a good choice for vinyl? It seems to be much cheaper. Hardly new. Misunderstood, perhaps? The product has been around for about 25 years. It is very quick dissolving and, as such, is well suited for use in vinyl liner pools. But, so is lithium hypochlorite. The difference is the potassium monopersulfate is not chlorine. It is a powerful oxidizer and, after being added to pool water, it will destroy organic contamination and convert the irritating odorous forms of combined chlorine back into free chlorine. If added in excess, it will convert the ordinary salt, present in the pool water, into free chlorine. It can be used in conjunction with all various chlorine products. Never combine different products together! Always add different products to the pool water and allow each to dissolve in turn. I hope that I have explained the product. Alan, I opened my pool this year and I have been battling the problem of algae. I have backwashed, vacuumed and nothing seem to work. When I vacuum there is a cloudy, dirty, slimy substance that appears on the top of the water. I have used a algaecide and a shock plus product. Please help me. You most likely have algae. Vacuuming alone will not get rid of the problem. Algaecide alone will not get rid of the problem. It may help kill some algae, but it will not solve the problem. The key is adding enough shock treatment product to kill and decompose the algae. Adding a single dose of pool shock may not be enough. You may have to add repeated doses, until you have established a Free Chlorine reading that lasts through the night. At that point there should be improvement in the water quality. Adding a Nano-Stick Clarifier will help with the process. This 21st Century technology will last up to 6-months and can be used in all types of pools and will all chemicals It is the easier way to crystal-clear water. Filter continuously until the water is clear. Thereafter, maintain normal operating conditions. I hope that this information will prove helpful. ► When Should I Shock My Pool? I have been told differing things about when or how often I should shock my pool. It is a 15,000 gallon above ground pool and is used by 2-3 kids all week and 2 adults on weekends. What's your take? I have no doubt that you've heard differing recommendations. The topic can be subjective. I suggest that you shock the pool under the following circumstances: a problem with visible algae seems to be developing, the Free Chlorine level has bottomed out, heavy bather usage is depleting the Free Chlorine level, the Combined Chlorine (chloramines) level is too high, there is evidence of a slimy feeling on the underwater surfaces or there is a loss of water quality that is not attributable to the overall water balance. In addition, you might consider shocking every Sunday Evening, as this is after the most active period of use. This will help destroy resistant organisms and allow normal chlorine to satisfy the chlorine requirements. Periods of heavy rainfall can bring contaminants and deplete the Free Chlorine level. This is not black and white and how much pool shock treatment needs to be added will depend upon the particular situation. The type of pool shock treatment used should be based upon the product best suited to the water chemistry and the sanitizer being used. I hope that I have helped to clarify the subject. ► How Much Shock Is Enough? I think that I understand the reason why I might need to shock the pool occasionally. My pool is about 9600 gallons and I find that, by following the label dosages, I do not always get the desired result. I add 2 pounds at a time, but I seem to need another 2 pounds. Is it just me or is the label wrong? Adding 2 pounds at a time, to your size pool, seems appropriate. The fact that you did not achieve the desired results or obtain a satisfactory Free Chlorine reading, indicates that the amount of algae (alive or dead), bather wastes, debris and combined chlorine was more than 2 pounds could destroy. Consider the 2 pounds as an application guide and not as an amount that will always do the task. Remember, you can always add more - you can't take out! Add 2 pounds, allow a few hours to circulate and test for Free Chlorine. If an adequate Free Chlorine level is found, hold off before adding more product. Unless your pool looks like a swamp, adding 4 pounds at a time could raise the Free Chlorine level so high that you might not want to or be able to use the pool, until the Free Chlorine level drops. And that is something you want to avoid! And that is something you want to avoid! Better circulation helps solve a host of problems. The Pool Circulator will boost the circulation dramatically and eliminate any algae-prone dead zones. I hope that I have been helpful. Any idea why when lots of shock was added to the pool and I know its there, I get no reading on 3 different test kits. Added through the skimmer and tested immediately, I got a reading of 10 (extreme high). In 5 hours no reading at all (extreme low). I used shock from two different sources. Also, I never had this problem in 30 years. Thanks. It's not the product and not the test kits. You simply have not added enough chlorine to react with all of the organic matter, algae (live and dead) and wastes in the pool, pipes and filters. Until you get a free chlorine level to last through an overnight period, you will probably not have added enough. Adding shock through the skimmer is probably contrary to package directions and the recommendations of the pool equipment manufacturers. A lot of the product will be consumed by the materials removed by the filter. No explanation for why you never had the problem before. Really bad closing or opening? I hope that I have been helpful. ► I've Shocked and Shocked? My pool developed algae because it was neglected for a week or two. I brought a water sample into a local pool store and the only thing wrong was that there was no chlorine. They gave me 4 pounds of shock and a bottle of algaecide. I was told to add 2 pounds of shock and some algaecide. The next day I was supposed to add the other two pounds. I did all that and there is still no chlorine reading and the pool is cloudy. There is still some algae left. I went back and bought another two pounds and still no chlorine. It has been 4 days now and the water is cloudy and there is no chlorine. The algae seems to be gone. I have backwashed the sand filter 2 or 3 times. What should I try next? From your description, it does seem that you have made progress. You didn't tell me how big the pool is, so I can't relate to the amount of shock added. However, it is clear that you did not add enough! The addition of two pound increments was probably reasonable for your size pool. You must keep adding shock, at the same rate, until a 1-3 PPM Free Chlorine Test Reading is established and lasts through the night. It is important to do this quickly. The longer you drag it out, the more the algae will grow, increasing the total amount of shock required. Once a stable Free Chlorine reading is achieved, normal chlorination should be resumed. During this period operate the filter continuously. The practice of frequent backwashing is wrong. Sand filters should not be backwashed daily: usually only when the pressure is too high or at periodic intervals. Frequent backwashing lowers the filter efficiency and could be responsible for the cloudy water. The dead algae and organic debris could be passing through the filter. The next time that you need to replace the filter sand, consider using a zeolite sand filter replacement media instead. It can produce much better water quality! Right now, try adding a Nano-Stick Clarifier, to improve filter efficiency and help remove the suspended particles that cause cloudy water. It can produce much better water quality and can last up to 6-months! Enjoy the summer. I hope that I have been helpful. ► Shocking A Biguanide Pool? Chlorine shock can't be used in a biguanide pool, but hydrogen peroxide can? I would like to eliminate the peroxide. Is it possible to use non-chlorine shock? Thanks. Non-chlorine shock is potassium peroxymonosulfate or potassium monopersulfate or monopersulfate compound. In any case, you can't use it with biguanide. Hydrogen peroxide is the product of choice. Adding chlorine or non-chlorine shock will destroy the biguanide. In fact, that is how you switch from biguanide to chlorine. Enjoy the pool season.